1 Two thousand years ago, Native Americans were living in the land that is now Colorado. These people were known as the Anasazi, or Basket Makers. They lived in houses that looked like apartment buildings called pueblos that were built from clay bricks. These buildings were connected by ladders made from logs and rope. Later, the Anasazi built their homes in the sides of cliffs. The cliffs protected them from their enemies. The Anasazi were farmers. This area of Colorado is very dry, so they had to find ways to water their crops. The Anasazi people learned to dig ditches from rivers and lakes to their crops. They were able to grow corn and other vegetables during the dry Colorado summers. In the late 1200's their luck ran out. For over 20 years, no snow, hail, or rain fell. The Anasazi had to leave their homes on the cliffs and move away from Colorado. You can still visit some of these old Anasazi homes in Mesa Verde National Park near Durango, Colorado. 2 Later, other Native Americans began living in Colorado. The Apache, Comanche, Kiowa, Navajo, and Pawnee lived in southern Colorado. The Arapaho and Cheyenne Indians lived on the eastern plains. 3 In 1803, the United States bought a huge piece of land from France known as the Louisiana Purchase. Some of this land later became Colorado. A young army officer named Zebulon Pike was hired to explore this new territory. When he crossed the eastern plains, Pike spotted a huge peak in the distance. 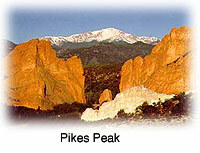 This peak was later named Pikes Peak. In 1821 the United States won a war with Mexico. Part of the land that was won became the southern part of Colorado.